I’m the queen of no-bake desserts these days! I’ve been whipping up mousse like it’s going out of style. 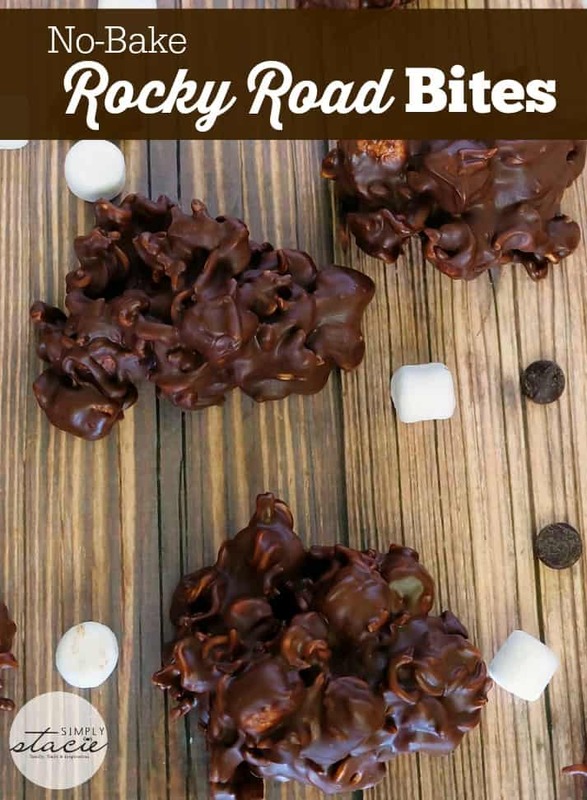 I have another simple no-bake treat to share today – Rocky Road Bites! You’ll only need four ingredients to make these babies – chocolate chips, mini marshmallows, peanut butter and ramen noodles. They are sweet and crunchy! Ramen noodles are around $0.29 for a package at our local grocery store. It doesn’t matter what kind you buy since you won’t be using the seasoning packet that comes with them. I would either discard it or save it for another recipe. I don’t think beef or chicken flavoured chocolate would be all that appetizing anyways….. I told you it was easy! After you melt the peanut butter and chocolate, it’s just a matter of stirring in the broken up noodles and marshmallows. Plop a dollop of the mixture on baking sheet lined with wax paper and put in the fridge for an hour. I store them in the fridge so they don’t melt. It keeps them fresh and ready to eat! This recipe makes about 10 to 12 Rocky Road Bites, depending on how big you make them. 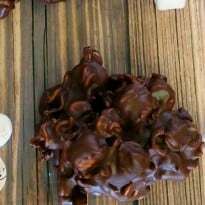 They remind me a little of my No-Bake Chocolate Peanut Butter Haystacks. That recipe uses chow mein noodles, peanuts, peanut butter chips and chocolate chips. I’ll be sharing more Rocky Road recipes coming up soon. I don’t want all those marshmallows I bought go to waste! Would you like a Rocky Road Bite? 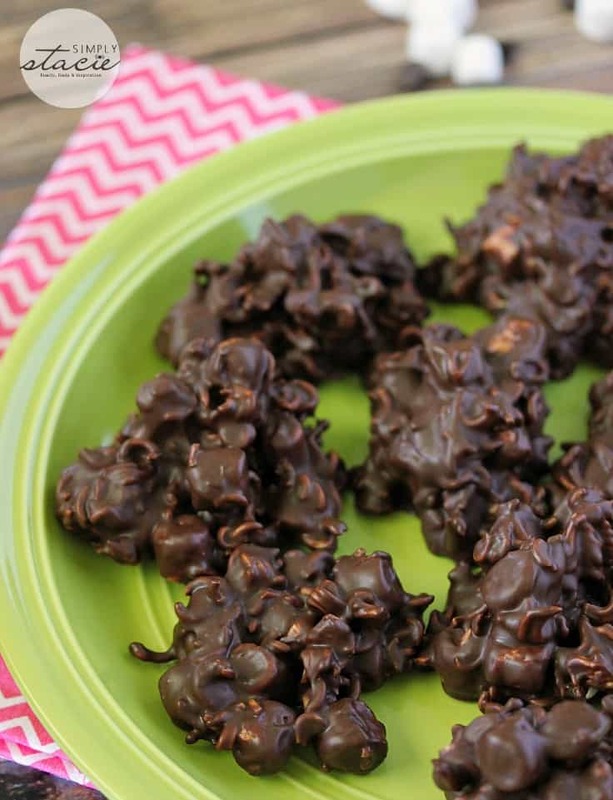 A no-bake treat made with only four ingredients! Line a baking sheet with waxed paper. Set aside. In a medium size microwaveable bowl, add chocolate chips and peanut butter. Microwave on medium for 1 minute. Stir. If not entirely melted, return to microwave and microwave an additional 15 seconds. Then stir till melted. Add in ramen noodles and marshmallows and stir to combine. Drop by spoonfuls onto the baking sheet. Place in the fridge for 1 hour to set. Break up the ramen noodles while still in the package to lessen the mess. 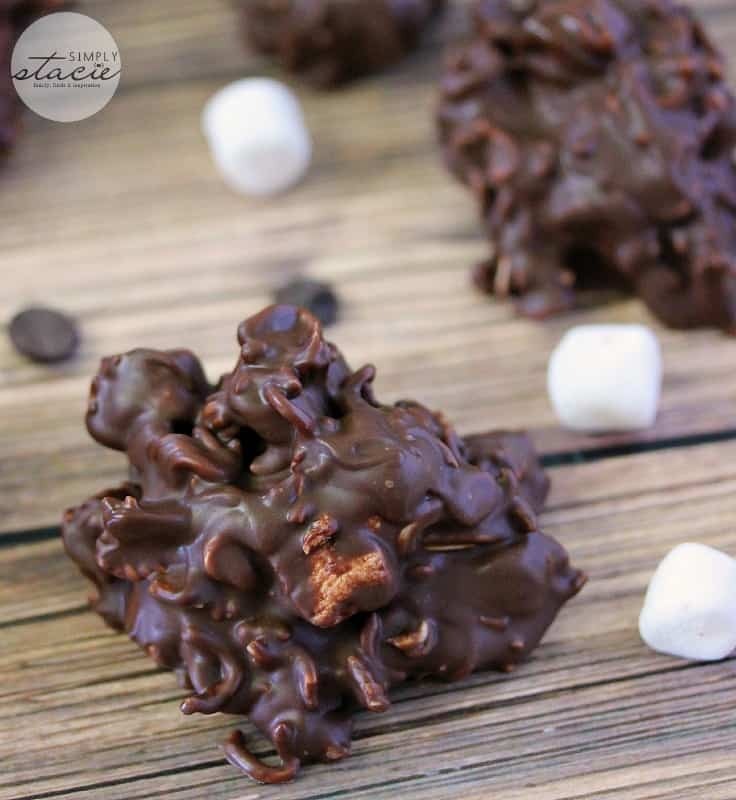 I know that my nephew, sister and Dad would all love for me to make these delicious and easy Rocky Road bites. I will have to make these and serve them cold. Thanks for an easy recipe. Interesting use of ramen noodles…..these could also be trouble here lol. So, do you deliver? I am salivating a little! These look amazing and right up my alley. When it starts getting warmer and humid, I don’t want to run the oven or stove. No bake and microwave recipes are my friends. Please keep them coming. These look so yummy and perfect for hot weather since you don’t have to turn on the oven to make them! I just made these but I used Fibre1 cereal instead of the noodles, to make it healthier, and they are so good!!! Those look super yummy. I’m going to print out the recipe and try to make some this week. I think my teen kids would especially like them. The hubby likes rocky road, i want to make this for him! No Bake recipes are perfect for summer. I’m sure my granddaughter would love to make these with me. This Looks amazing!!! Pinning and Sharing! Perfect, I think I’ll replace the ramen noodles with something healthy too, though that ingredient sure was a surprise! Thanks for sharing on craft schooling Sunday! We will just love your Rocky Road Bites. I appreciate you sharing this awesome post with Full Plate Thursday and have a great day. No baking and ramen noodles? I’m so on board! cool recipe..interesting tidbit…ramen here in Hawaii are called ramen but pronounced Sighmen. you can even find them on the mcdonalds menu!! !